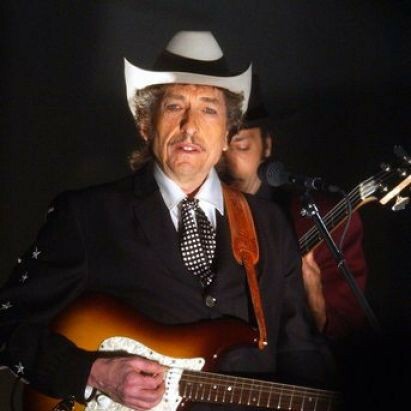 I let 1996 Dylan slide a little bit because there wasn’t a lot going on except more and more and more of the Never Ending Tour. I thought about posting something about Dylan’s show at the 1996 Summer Olympic games in Atlanta but I couldn’t really find much to say about the show except for “Hey! Dylan! At the Olympics! Isn’t that sort of strange?”. A lot of that show is on YouTube, so you can check it out for yourself. Here he is doing “All Along the Watchtower”. One of the fascinating things about Dylan at this point, now that I’m in 1997, is that things like another live version of “All Along the Watchtower” have become like white noise to me. I don’t actually skip the song if I’m listening to a live show, but I don’t actually listen to it either, if you know what I mean. It’s just sort of there. One of the notable things about 1997 is that the show from April 7 (his only ever show in Fredericton, NB – so far) contained, as its third song. What was out of the ordinary was the fact that this was the one thousandth time that Dylan had performed this song live. 1,000 times. It sort of boggles my mind. Actually, what is even more amazing is that, as of this writing, Dylan has now performed the song 2,243 times, including three times last week in Sydney. There are another half dozen that will cross that threshold this year or next at his current pace of touring. I’ve listened to that 1,000th “Watchtower”. There’s nothing unusual about it at all. If Dylan knew if was his 1,000th (I highly doubt that he did), he did nothing to note that fact. It has the same sped up lyrical phrasing that he’d been singing for a while. What is noteworthy is simply the sheer scope of what Dylan has done by this time as a touring act and, further, the fact that he would just continue to do it. My favourite moment in the generally under-rated movie Funny People is when Seth Rogen asks James Taylor if he ever gets tired of singing the same songs over and over. I think I like that moment because that is exactly the question I’d like to ask. Don’t you just get bored of it? I feel like I would. Dylan, of course, changes his songs so frequently and so dramatically that maybe it keeps him from getting tired of it all. He just keeps marching ever forward. Tonight, Fredericton. Tomorrow St. John. Then on to Bangor and Portland, Durham and Waltham. Two riders were approaching, the wind began to howl.